Well I think everyone knows already, but I think it appropriate to post, since it is a pretty big deal. Last weekend (July 22) Erin and I picked up our brand new car! The new car, a 2006 Hyundai Sonata, in many respects is a more featured version of our other car, a 2001 Nissan Altima. The new car comes to us courtesy of Erin's generous parents. We have been talking for a while about the possibility of second car, as the Altima is getting on. We wanted the security and convenience of a second car when we need one, which thankfully infrequent. While we were mulling it over, Erin's parents offered us a gift of money, roughly equivalent to the price of the car, and so car shopping began in earnest. I think we jumped all over the map from used, domestic, luxury, hybrid, huge, tiny and all the other permutations of cars, before we even came to a conclusion of what kind of car we wanted. We were really happy with the Altima, as it has both a large hauling capacity, reasonable fuel economy (all though not as good as we thought, it isn't bad,) sufficient get up and go, and it was comfortable. One caveat on the last one, for some reason the gas pedal was set in such a way that I used to get an awful cramp on long drives, but as Erin is really the principle driver on a day to day basis, her predisposition to platform-esque shoes makes it a non-issue. So we finally closed on looking for a car in the same size class, with key features we were looking for being safety, fuel economy, and price. Of course price and fuel economy can be in direct conflict. Safety was also a little complicated, on the surface we wanted a vehicle that had tested well in crash tests. It was also important that the car be able to keep you safely out of crashes in the first place, so that means ABS, and a drive train with the power and control get you out harms way. Our shopping took us to a number of dealerships, the most memorable trip was probably Honda, and I mean memorable in a bad way. The salesman we dealt with at first was courteous, and we were clear with him from the beginning that we had no intention of buying on the spot. He seemed accepting of this and took us out to test drive the Civic and the Accord. I must say I was completely under whelmed by the Civic. The car had the get up and go of a high school drama student with Mono, (trust me I have seen a few of those, and snails go faster.) The Accord performed admirably, but was nothing special. What really turned us off was the sales manager, our salesman stepped out of the room for a moment to make a photocopy, and in stepped "The Closer." "The Closer" is the guy who gives salesmen a bad name, he slithered into the room and started talking, he talked without breathing, and without acknowledging our existence. I think at one point he shook our hands, but the experience could easily have been confused with a cold clammy fish wriggling through its death throws in your palm. We left immediately looking for a safety shower to rinse sleaze from us, while our test drives had already put us off Honda, the sales manager put us off that dealership for sure. If we had wanted a Honda, we would not have gone back there. Our next trip was Toyota, and Toyota had been an early favourite for us, the Corolla and the Camry being stalwarts of the auto industry. The test drives also left us in favourable esteem of them. We were however unenthused by the interior styling of the Corolla. While the Corolla is a fine car, a model of value, and history of reliability, it failed to whelm any guttural response. When spending the kind of money involved in a car purchase (even if it is a gift,) I really feel like you need to want the car, in needs to strike a cord with your desire, beyond the sheer practicality of it. Neither of us could get beyond that feeling, and in the end I think we exaggerated the feeling back and forth until we had thoroughly put ourselves off the purchase. That really only applied to the Corolla, the Matrix, Prius, Camry, and Camry Hybrid sat on the consideration pile for a long time. In the end we didn't return to Nissan to look, on one hand I think we wanted a change, and on the other hand we found the Nissan's really didn't meet either our safety or fuel economy desires. I think a lot of people have questioned our safety first motive in this purchase, and I don't want to sound trite, or put anyone down, but two things really motivate this. First off, as young healthy adults the number one way we are likely to die is in an automobile accident, as has become painful obvious this Spring with Andrew Desmond. The other, is that automobile accidents have been a very really part of Erin's and my life. Just ask our poor Altima, it has had more then its fair share of battle wounds. Most of which were the classical definition of accident, unforeseeable, unavoidable circumstances that brought another vehicle in contact with ours. One of the more ridiculous was in a parking lot when Erin was clearly blocking an individual who started pulling out into her, Erin was blocked in and couldn't move. She jammed on the horn repeatedly, and other drive just kept coming. When the inevitable collision occurred the other driver (who paid for all the damages) made the comment that "I heard honking, but I thought it was for someone else." Apparently she chose not to look about and see the big car right behind her. Anyways I digress, but my point is that I intend for Erin and I to become nice and curmudgeonly in are old age, and think a few extra air bags are worth sacrificing a leather seat, or an umpteen disc changer for. Back to our shopping, we spent the rest of the day show room cruising, but avoided further test drives, as you can only suffer so many pithy vapid conversations with strangers in the back seat before the whole process becomes tiresome. On a Toyota concluding note, the sales manager at this dealership was much more astute in the art of human observation. Clearly understanding the statement "not going to buy today" he took only a moment of our time to express his good will, and entice us to return to his dealership when we were ready to buy. Clearly this could have been devoid of sentiment but he behaved genuine and professional. At the end of the day we had cruised Subaru, and Mitsubishi, and we met with Erin's parents, who had also visited Toyota, as well as a few European dealers, and compared notes. That week we made one final trip to Hyundai of Oakville. The trip was almost perfunctory, not expecting to see much, and thoroughly exhausted by the whole process. I think we actually went intending to look at the Avalon, which was really well outside our price range. The whole night was a little surreal, as we ended up with he used car sales manager, who was on duty covering for someone, and it was his first shift since spending five months on paternity leave. So he was a little behind on his research, and it was a slow night, so he just tossed us some keys and let us go out and give it a try on our own. I think a combination of the salesman's candour, and his unexpected trust put us in the right frame of mind, and the car did the rest of the job. 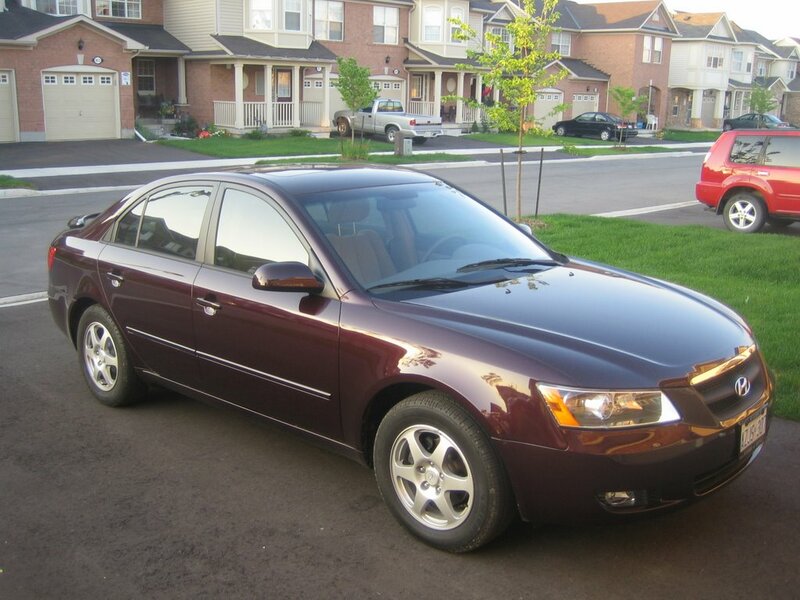 At night the car glimmers an almost metallic purple or black, when the sun is up it's a metallic burgundy colour. In any light is a nice looking car! The spoiler adds an aggressive look to the car, and as it isn't really a standard option on the vehicle it makes it unique. The interior is a charcoal grey, which is neither here nor there, but the dash is laid out in a much more modern way. The instrumentation panel is really well organized and modern making it intuitive to use. Most importantly the car passes that resonance test that makes it fun to own and drive. As for our other requirements, well it has a 5 star front and side crash test rating, and won the EnerGuide award for most energy efficient vehicle in its class. It is also easily 5-10% less then a similarly equipped competitor car. So top marks in all our criteria! Like I said at the beginning about it being a better version of our Nissan, really is a credit to both the Nissan, and the Sonata. The Nissan has served us well, and will continue to do so. The Sonata improves upon it by getting better fuel economy, more storage space, more passenger space, better pick up, better handling and a snazzy sun roof. So both cars meet our needs well, and can really be used interchangeably. The only question now is who gets to drive which car? The answer is Erin gets the new car. We are both really happy with the Sonata, and at this point wouldn't hesitate to recommend it to friends. We are both being a little silly and showing it off to friends, but when it comes to a new car, I figure that so long as it still smells of new car then boasting is permitted. So there you have it, the new car story! Sorry Geoff - I appreciate your tact, but I have to defend my girl. Have you ever wondered what kind of cat Loki is? Curse you 1.5" curse you!